In northernmost Oakland is the small, steep Panoramic neighborhood, which perches on the high ridge between Strawberry and Claremont canyons. 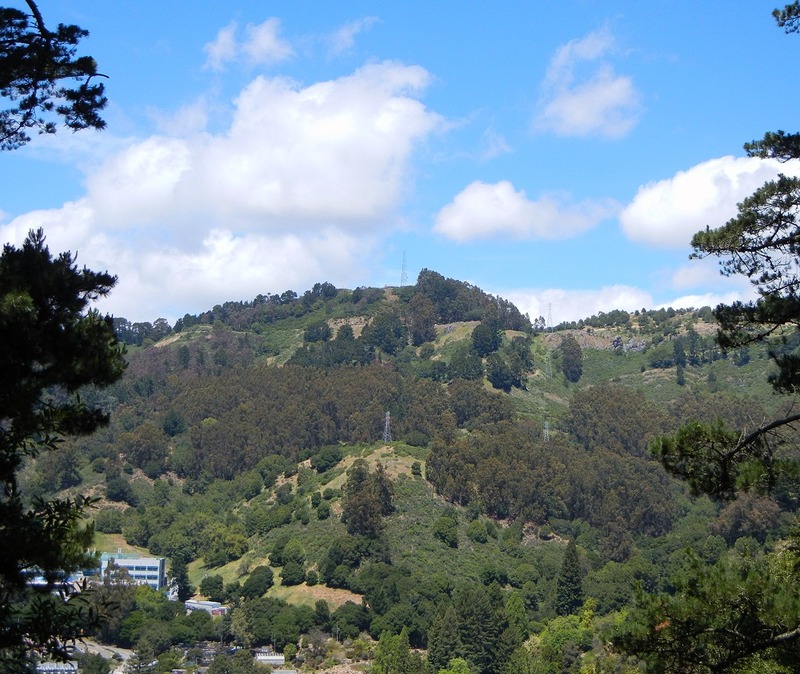 At the top of Panoramic Way is this view north across Strawberry Canyon to Grizzly Peak, which at 536 meters (1758 ft) is the highest point in Oakland. Click the photo for a 1000-pixel version. The bottom of the photo grazes the UC Botanical Gardens. The lowest slopes in this view are underlain by the Claremont chert, up to the powerline tower directly below the peak. Above that is the Orinda Formation, and the ridgeline is lava of the Moraga Formation. To the right of the peak, on this side of Grizzly Peak Boulevard, is a big, towering outcrop of basaltic lava; here’s a closeup. That seems like it would be worth a visit, if the poison oak isn’t too bad. This entry was posted on 25 July 2011 at 1:39 pm and is filed under Oakland geology views, Oakland rocks. You can follow any responses to this entry through the RSS 2.0 feed. You can skip to the end and leave a response. Pinging is currently not allowed. Looks like “Grizzly Caves” to me, “caves” in the loosest sense. It’s an easy hike-down from the road. Neat rocks, for sure. If you realize that you can die waiting for police in the main part of Oakland, imagine how long it takes them to respond to a call from the top part of Panoramic when the only way for OPDto reach you (other than fire roads) is to go thru Berkeley and up Panoramic. Really?! Seriously, do you spend your day coming up with new and inventive things to be scared of? Having cycled past it dozens of times, Grizzly Peak strikes me as being about the most benign (not to mention beautiful) place imaginable. Thanks to Andrew for revealing the geology to me … on my next ride, I will think about the Moraga Formation … NOT how scared I am of some imaginary threat to my safety. COULD some horrible crime befall me on Grizzly Peak? Yeah, it could. But it probably won’t. I could also be struck by a meteor tomorrow. But I probably won’t. Life is too short to go around being scared of things that aren’t major threats. And trying to make everyone else needlessly afraid of non-threats is NOT helpful. I don’t particularly mind what he said; I’ve pointed out the hazards of living in the high hills here before, especially near the fault. It’s one reason why Leonard and I don’t live on Panoramic Way, although police access isn’t as high on my list as his. Yep, those rocks are easily accessed from a trail that connects the middle of upper fire trail to grizzly peak. There are a few small caves/crevices that make popular spots for ‘enjoying the view’.